Flyer printing can help you to advertise your business, quickly and affordably. Flyers can be known as pamphlets, a flyer is typically single sided or double sided. Sometimes flyers are confused with leaflets, the main difference is a flyer is printed on a heavier stock 300 -350gsm is the norm. Leaflets are printed on a lighter weight stock, like a 150gsm. Printed flyers will help you to promote your business; each year we print and deliver flyers to businesses across the UK. We print flyers at the best possible price and each year we print flyers for Pubs, Nightclubs, Restaurants, Hair Salons, Theatres, Art Galleries and Small Businesses. Our affordable flyers can be used by music promoters to advertise music events, music festivals; and they can be used to promote your band gigs. Flyers can be used to get your message out there; swiftly. Looking for a way to promote an event? Use a flyer, they are a very powerful marketing tool. Flyers are extremely cost effective marketing and they are extremely easy to distribute. If you are starting a new business there is no better way to advertise your new business, if you are on a budget, use flyers. You can purchase them in smaller quantities to save money. Distribute them amongst your local community on a regular basis and this will help your business to grow. To keep your business flourishing you will want to use flyers on a monthly basis. Flyers are a direct and practical way to communicate your message; include them in your small business marketing mix. Our digital printing service means we can print your flyers fast and at a competitive price. Flyers can be printed in full colour or black and white. Flyers come in a range of sizes, A6, A5, A4 sizes, you can have your flyers printed single sided or double sided. If you are holding a launch party, you can use party flyer printing to promote and invite clients to your event. You will want to get your message out there fast to ensure that your event is a roaring success. Our digital printing solution is great allowing us to print your party flyers; fast, and in small quantities saving you money and wastage. Make a lasting impression with your flyers and have them printed in eye catching colour. Budget flyers are one of the most versatile and effective marketing tools that you can use to get peoples attention, if you are on a tight budget give us a call on 01284 767575 and we can provide a price for the printing of your flyers that won’t make a dent in your finances. Don’t worry if you don’t have a flyer design, our designers can turn your ideas into reality and create a compelling flyer design that you can use to publicise your business. We have set flyer design price. 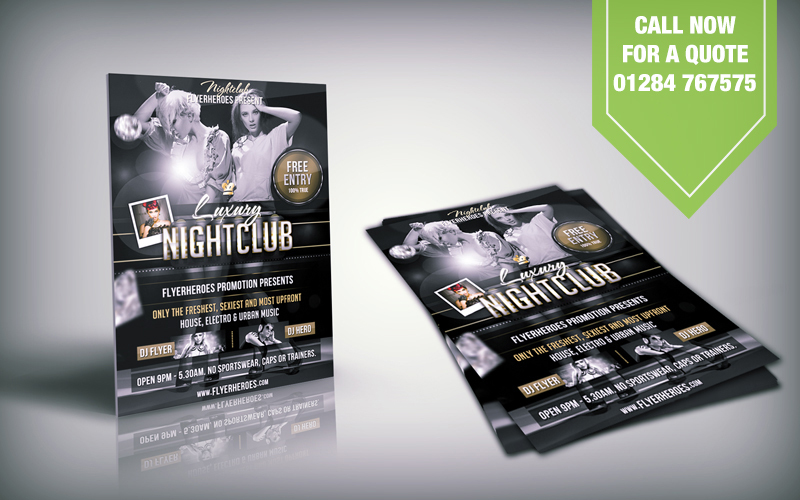 Call us today on 01284 767575 for a price to design your flyers.